When I saw bits of this film on the television I wanted to go to the cinema to see it and so Mummy took me as Daddy said that he didn't want to see it. I made Mummy take me two times because I loved it so much. The film is about a man who is an ice hockey player who is called The Tooth Fairy because he bangs into people when he is playing and their teeth fall out. When he is mean to his girlfriends children he gets punished and turned into a real tooth fairy! It's meant to be a punishment, but I think that he likes it after a while and I would love to be a tooth fairy. Mummy says I can't tell you how it ends because you might not of seen it and it wouldn't be fair. I am going to ask Father Christmas to bring me a copy for Christmas, and if you haven't seen it by then you can come round and watch it with me. I am going to let Mummy tell you the rest now. Top Ender really loved this film and even I sat through it twice, and the second time I didn't buy popcorn so it can't be all that bad. It is a sweet story and we probably will buy it on DVD for Top Ender as a stocking gift, just don't tell her! It is the sort of film that children will love, because of the comedy and simplicity of the storyline and would be perfect Sunday afternoon viewing when you are trying to digest the roast. 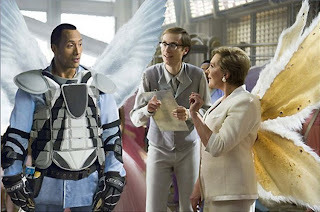 The Tooth Fairy starring Dwayne Johnson will be out to buy on DVD and Blu-ray on 20th September 2010 at a cost of £19.99 and £24.99 respectively. Its a PG and the lovely Julie Andrews and Stephen Merchant also star with Dwayne Johnson and there is a cameo from Billy Crystal.